Cat id Name Tag | Cat face Gold | Deep Engraved. Gold Cat Face shape pet id tags.. Deep Engraved on one side only due to the design on the front with your contact details and posted within 24hrs. of receiving your order. 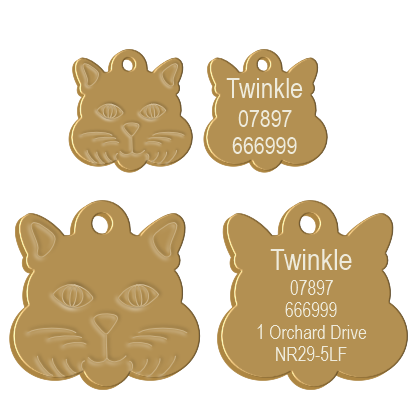 These Premium Coated Gold Cat Face Pet ID tags are the genuine hard wearing tag from the USA. 22 mm Small We will engrave 3 lines of text on these. 29 mm Large we will engrave up to 5 lines of text on these.